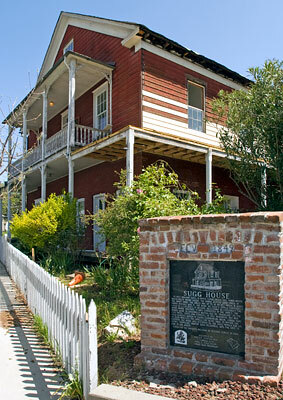 In 1857, William Sugg, a freed slave, built this three-room, brick-faced adobe house. The adobe blocks were made in the front yard. The walls are up to 18 inches thick. A wood frame kitchen was at the rear. As Sugg's family eventually grew to 11 children, it became necessary to construct the wood frame addition. It was completed in the 1880's. The rooms were occasionally rented out as "overflow" to the city hotel. State law changes, in 1921, requiring hot and cold running water in every commercial room, ended that 41-year practice, the family not being able to afford the expense. The home was occupied by the Sugg family for 125 years. Grandson, Vernon Sugg McDonald, was the last to live in the house. Placed on the National Register of Historic Places in 1984.